To guarantee your campsite, a deposit equal to at least your first night will be charged to your credit card at the time you make your reservation. Make your online reservations anytime, day or night, at KOA.com. You’ll receive a confirmation email from the campground once you complete your reservation. Lodging reservations have a 2 night minimum. All sites and lodging require a 3 night minimum on Holiday Weekends (Memorial Day, Fourth of July, Labor Day, Columbus Day). 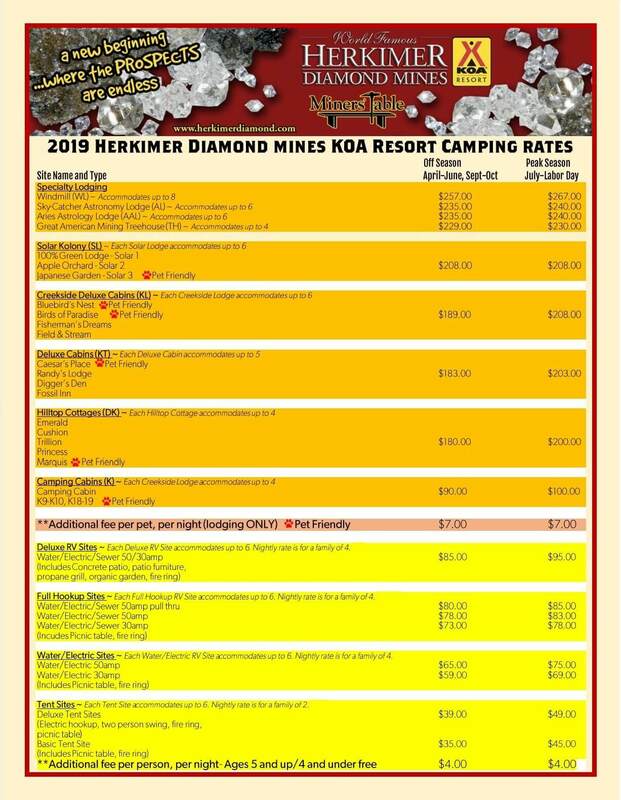 If you need to cancel your reservation, please call before the deadlines listed below to receive your deposit refund, minus a $10 cancellation fee: Text and email notifications of cancellations are not acceptable.Please call before these deadlines to receive your deposit refund minus a $10.00 cancellation fee.RV/TENT SITE: Notify KOA 48 hours, by 4PM, prior to your arrival.CAMPING CABINS: Notify KOA 7 days, by 4PM, prior to your arrivalDELUXE CABINS/SPECIALTY LODGES: Notify KOA 14 days, by 4PM, prior to your arrival. Holiday Weekends: Memorial Day (peak season rates apply), Fourth of July, Labor Day, Columbus Day (peak season rates apply) have a non-refundable cancellation policy. Pet friendly lodging includes Camping Cabins #9, #10, #18 and #19. Bluebird’s Nest, Birds of Paradise, Caesar’s Place, South American Mining Adventure and Solar III. A fee of $5.00 per pet per night is required. To guarantee your campsite, a deposit equal to at least your first night will be charged to your credit card at the time you make your reservation. Make your online reservations anytime, day or night, at KOA.com. You’ll receive a confirmation email from the campground once you complete your reservation. Lodging reservations have a 2 night minimum. All sites and lodging require a 3 night minimum on Holiday Weekends.